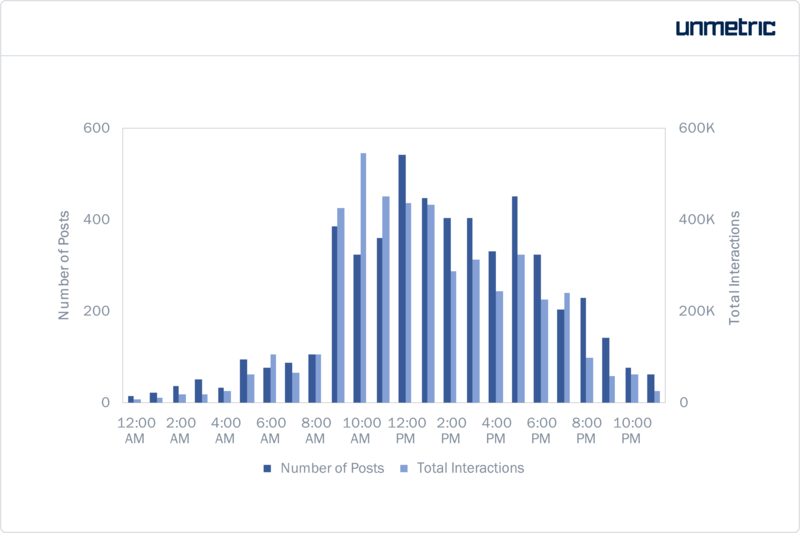 Is there really a best time to post on Facebook? Many argue that timing on Facebook is irrelevant. As the organic reach that brands and publishers receive on the platform decreases with every News Feed update, backing up your posts with a paid push has become essential. Since a certain number of people will be reached when you promote, timing ceases to be a concern. This argument stands as long as the parameter used to judge the best time to post is reach. 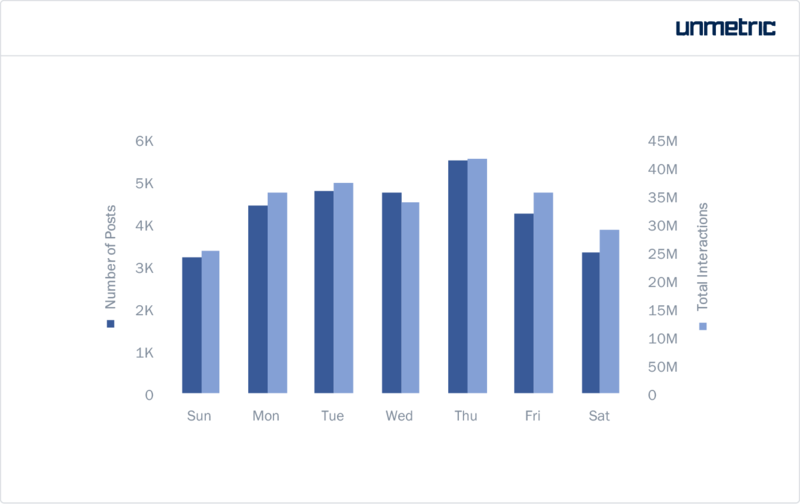 If you look at Facebook Insights for your page, you’ll see that it provides you an estimate of when your audience is online (see picture below). They suggest that you post when your audience is online. But is reach the right metric you should base your decision on? As social media marketers, we have a valid excuse for checking Facebook even at work. Because, hey, I just wanted to know how my last brand post did! But I rarely watch videos from publishers or other brands when I (quickly) scroll through my News Feed. In this article, I look at overall interactions to judge when brands should post on Facebook. By interactions I mean a sum of reactions, comments and shares. This way, we’ll get an idea of when brand posts are most likely to get the best engagement. One quick note on the data used in this report: I’ve analyzed how brand posts published by 100 US focused brands selected on the basis of audience size, between November 15th and December 22nd, 2017. As this study considers brands alone, there are two ways of zeroing in on the best time to post. One is based on when brands actually post and how many interactions these posts bring in (Let’s call this BRAND activity). The other is to see when people interact with brand posts (and this AUDIENCE activity). For example, say Hyundai posts at 11 AM and gets 2 million interactions within an hour and 500,000 interactions the hour after. In the charts on BRAND activity, all 2.5 million interactions will be counted towards 11 AM while in the charts on AUDIENCE activity, only 2 million will be shown under 11 AM and the other 500,000 will be put under 12 PM. All the data presented here is in EST (New York time). In this section we take a detailed look at brands from various industries. Since sports, media and entertainment brands and celebrities usually experience interactions on a larger scale, we’ve excluded them from this set. Based on brand activity, Thursdays saw the highest volume of posts and interactions. Interactions and post volumes were lower during the weekends. According to a study by Falcon, Thursdays witnessed high user engagement, as did Fridays. This is, however, not limited to brand posts alone. 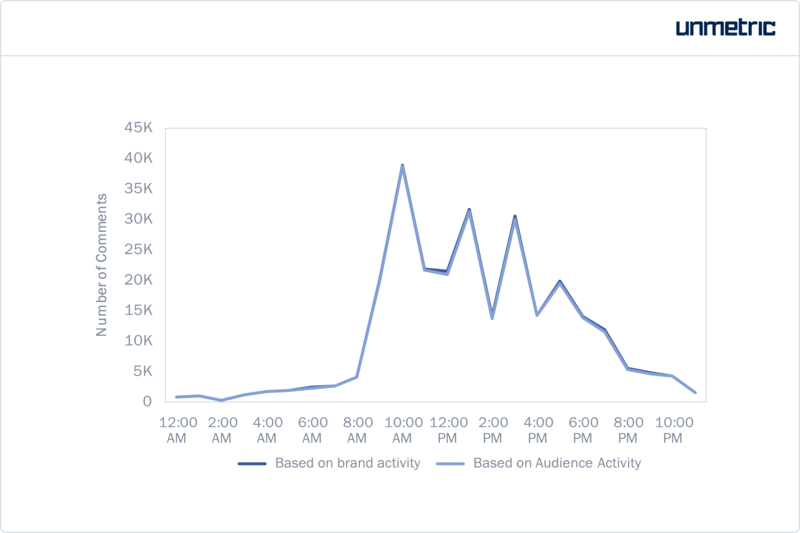 So we took a quick look at the data on when Facebook users engage with brand posts. Based on audience activity, Wednesdays witnessed marginally higher interactions per post than Tuesdays and Thursdays. As you can see, the interactions per post recorded on each day of the week remains fairly steady. Except for minor dips on Sunday and Monday, brand posts were likely to get the same amount of interactions on each day of the week. 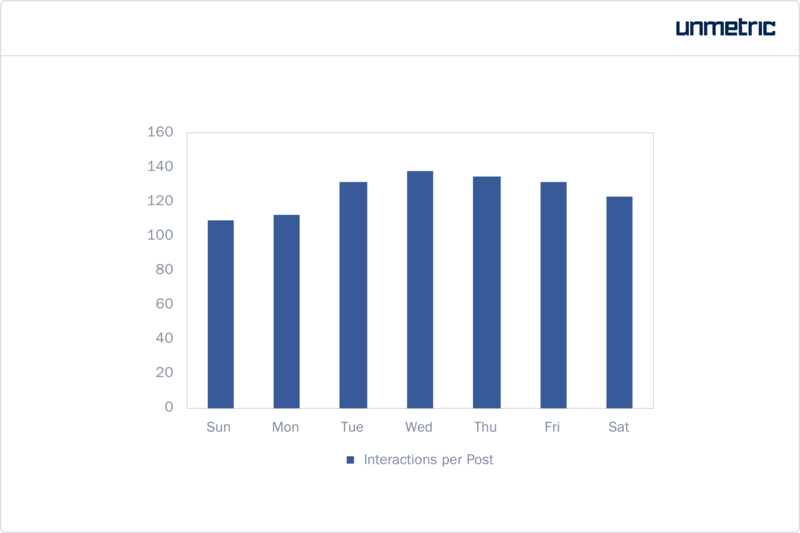 Even though brands were more likely to post between 12-1 PM, they received the highest amount of interactions on their posts published between 10-11 AM. 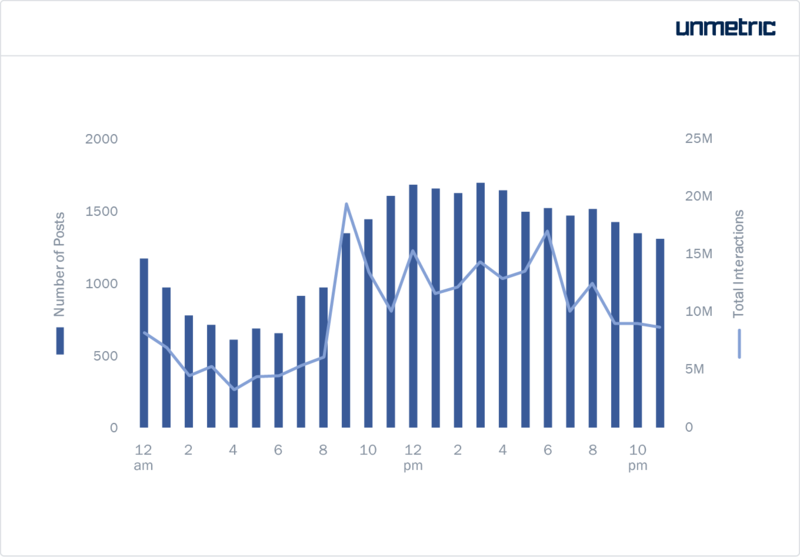 This data suggests that brands should post on Facebook between 9 AM and 2 PM to get the most interactions. In fact, posts published in this five-hour window brought in 50% of the overall interactions. However, you also have to consider the fact that 40% of the overall posts were published between these hours. So, the sheer volume of posts could be a strong reason why this so many interactions were recorded during this window. Further, as brands tend to post more during office hours, they do not receive a lot of engagement later in the evening. As you can see, over 200,000 interactions were registered every hour between 10 AM and 11 PM. Audience activity is the highest between 8-9 PM. This suggests that brands should schedule more posts close to this hour to capitalize on user activity. If you are a Facebook user, then you probably know that you’ll be more likely to engage with content types other than videos when you quickly check Facebook at work or when you scroll through your News Feed while you are doing something else. When you are posting to your brand page, you need to consider if your video is likely to do better at a different hour. 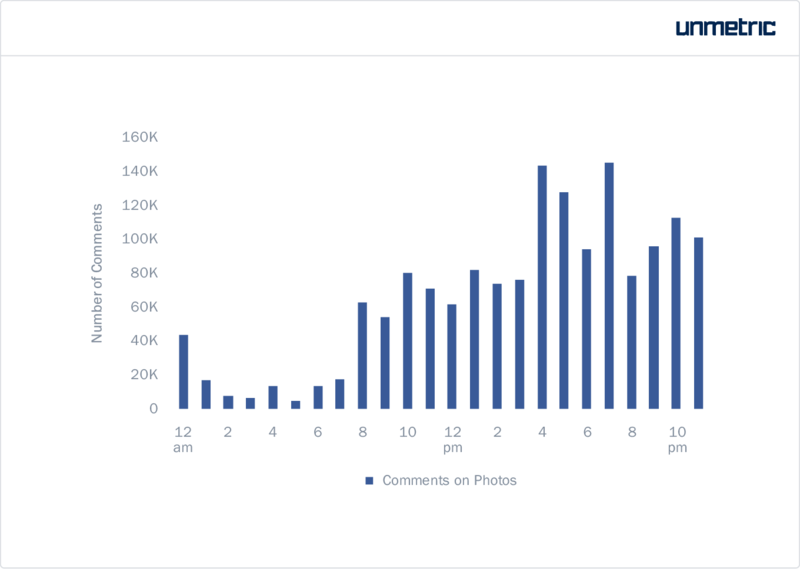 Here, we take a look at when the best time to post photos on Facebook is vis-a-vis that for videos. 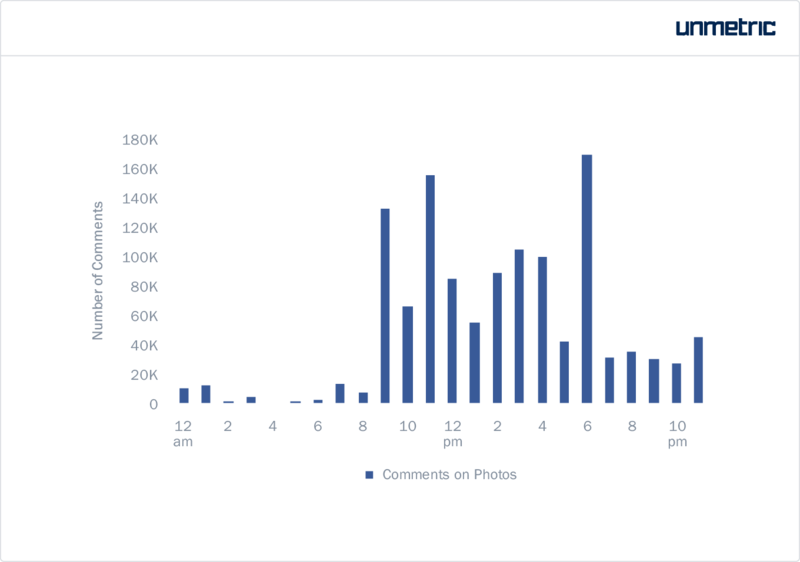 The chart below shows the number of comments received by photos at each hour of the day. We’ve differentiated the number of comments received based on brand activity and audience activity. 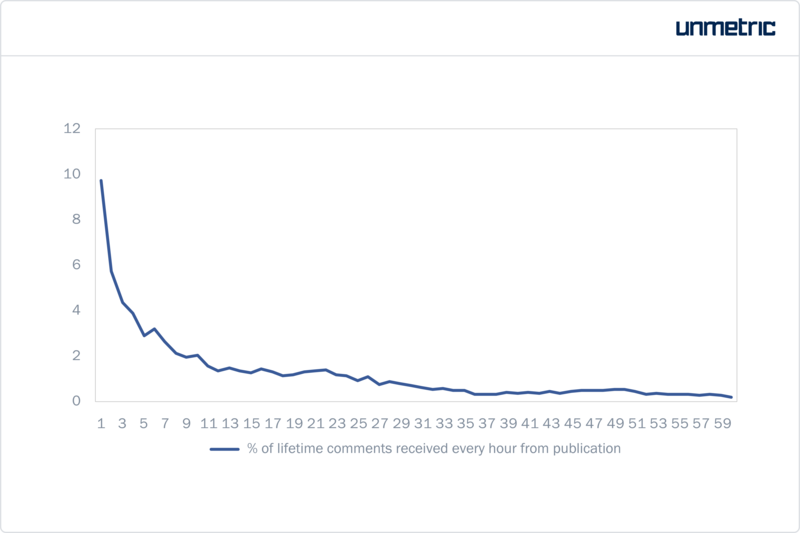 That is, the dark blue line for brand activity indicates the number of comments received by a photo that was published at a particular hour. 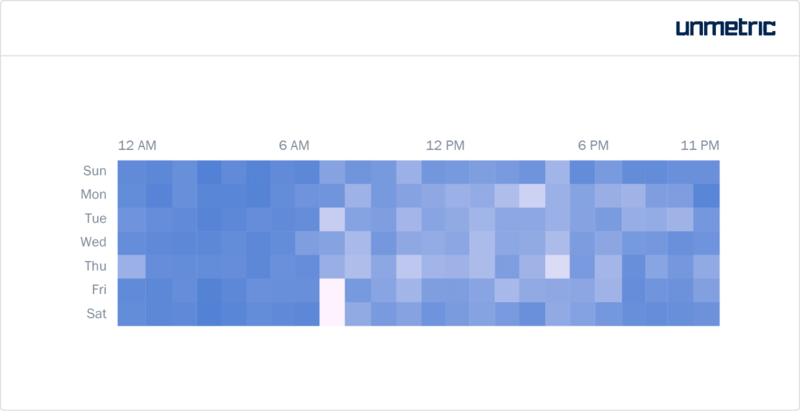 The lighter blue line for audience activity shows instead, the number of comments received by any photo at a particular hour. Photos receive the highest number of comments between 10-11 AM. 1-2 PM and 3-4 PM also worked out well. Now let’s find out when is the best time to post videos. Based on the number of comments received, the best time to post videos is between 9-11 AM and 12-1 PM. Apart from the difference in the best time to post for these two content types, another interesting observation can be made from these two charts. 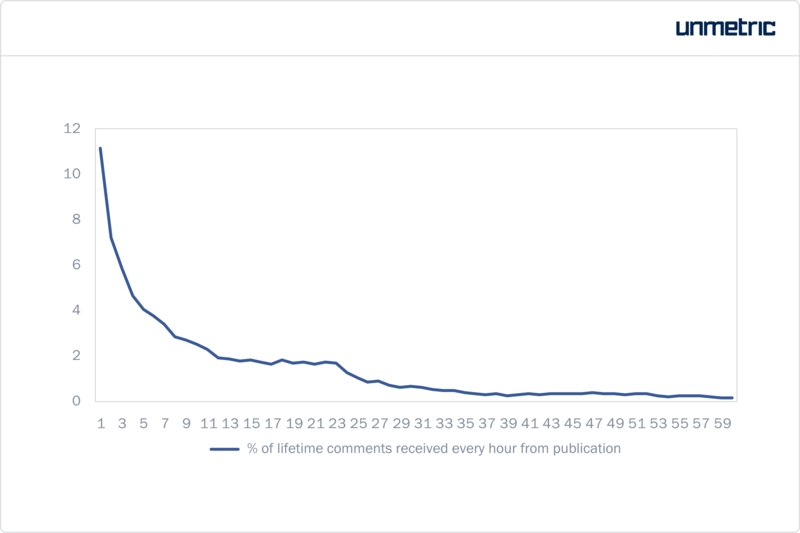 The comments received at a particular hour of the day seems to coincide with the comments received by posts published that hour. This would suggest that most of the comments received by a post come in within an hour from publication. To see if this holds true, let’s take a look at the velocity of interactions. 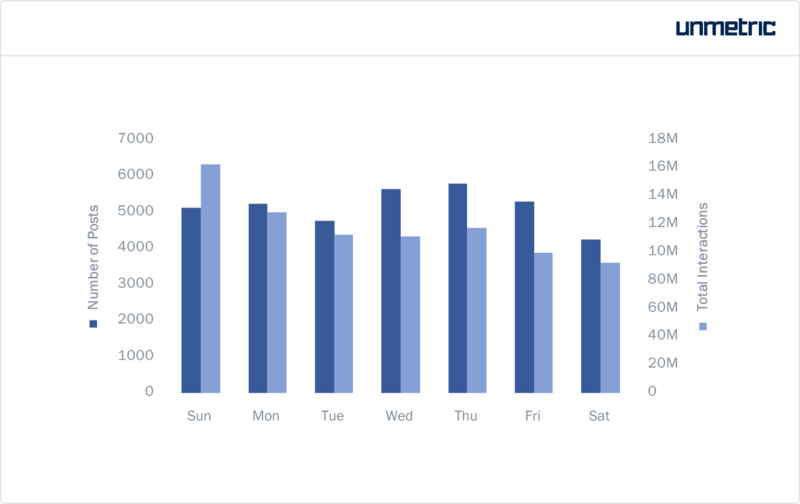 The chart below shows the percentage of interactions that were received on average by a brand post every hour from publication. Around a half of all the comments a post receives in its lifetime are received within 12 hours of publication. While photos tend to receive most of their interactions early on, for videos, this process is a bit more prolonged. For instance, post the 40 hour mark, photos received only 5% of their lifetime comments. Videos, on the other hand, received close to 8%. Keep in mind that a portion of the posts included in this analysis were promoted. Promoted posts can keep accumulating interactions days from when it was originally posted. This makes it all the more crucial to get your timing right on your organic posts, as the first hour is so crucial. 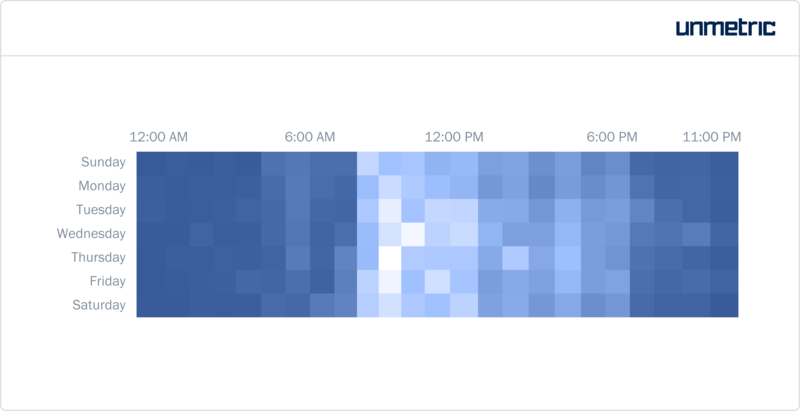 This heatmap shows the interactions received by brand posts based on their time of publication. You’ll see that on all days, 9 AM – 2 PM witnessed good engagement. Brand posts published on Thursday between 9-10 AM got the most interactions. Here, it’s obvious that interactions come in much later on in the day too. 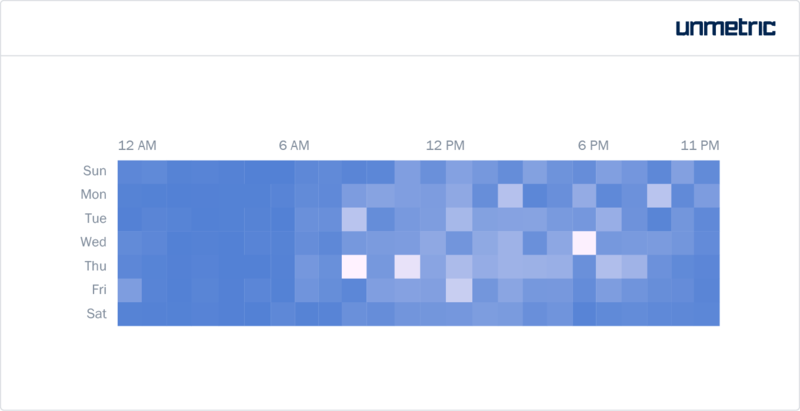 In fact, 8-9 PM seems like an engagement window brands should capitalize on. The golden hour, as per this chart, is Thursday between 8-9 PM. 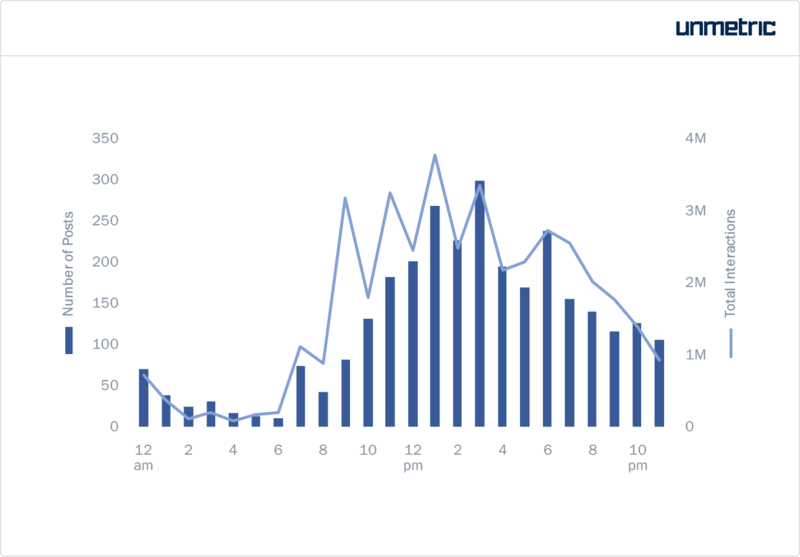 Based on brand activity, the best time to post on a Sunday would be between 9 AM and 2 PM. In this interval, close to 58,000 interactions were registered every hour. 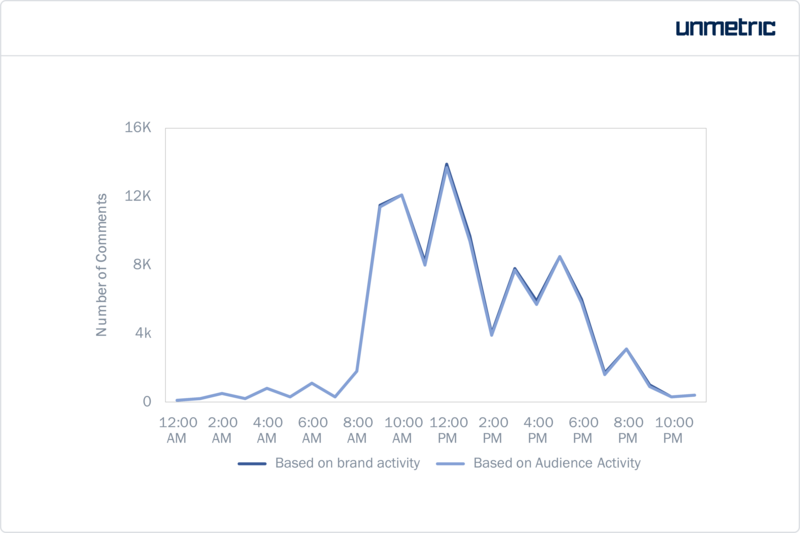 The highest engagement was received between 9-10 AM. However, this might have something to do with the comparatively high number of posts that were published at that hour. Based on audience activity, 12 PM to 10 PM was characterised by an actively engaging audience. Mentionlytics research suggests posting between 12-1 PM to get the best results. This is right where our data on the best time to post based on audience activity and brand activity intersect. Also note that the most number of audience interactions was registered between 8-9 PM. So, publishing a post around 8-9 PM might be a bright idea considering that your audience is the most active then. 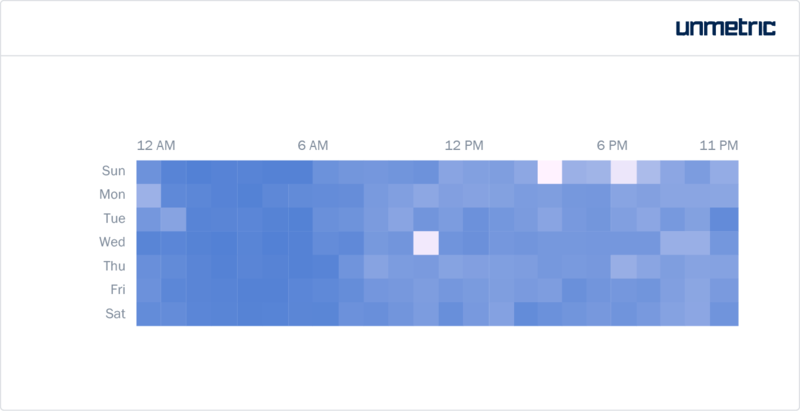 The reason why brand posts that time slot does not look very promising in the brand activity heatmap is because only a handful of posts were published at that time. In any case stick to posting between 9 AM and 10 PM. Now, let’s take a look at personalities, media and sports separately to see if they show a different engagement pattern. According to the data, the best day to post for personalities is Thursday. The most number of posts are published on this day. Consequently, they received the highest engagement on posts published on this day. Surprisingly, celebs tend to slack on their social media activity during the weekends! As you can see, the number of posts published on Sundays and Saturdays are far lesser than their weekday tally. The chart below shows the number of posts that were published every hour and the number of interactions they resulted in. As you can see, there are sharp surges in engagement. This increase in interactions cannot be explained by an increase in posting volume, as they do not often coincide. For instance, between 12-1 PM, even though more posts are published than in the previous hour, the number of interactions fell. 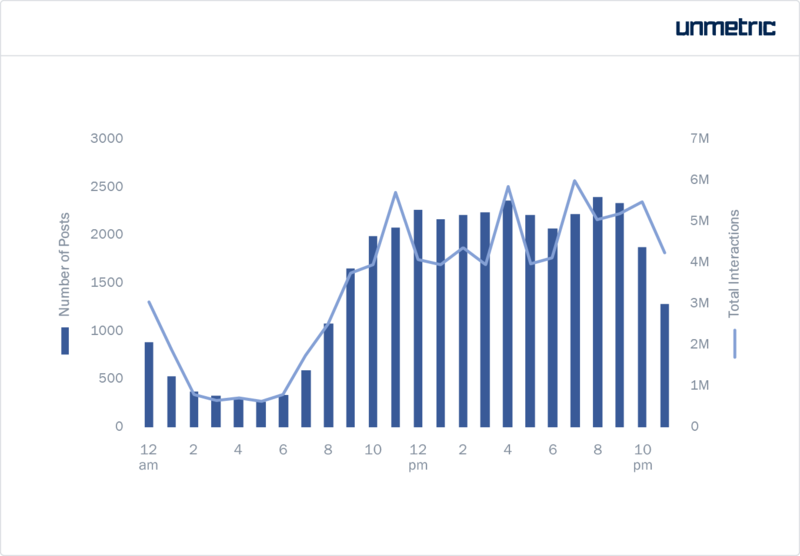 Personalities witnessed the highest engagement between 1-2 PM. 80% of all the interactions they received came from posts published after 7 AM and before 8 PM. 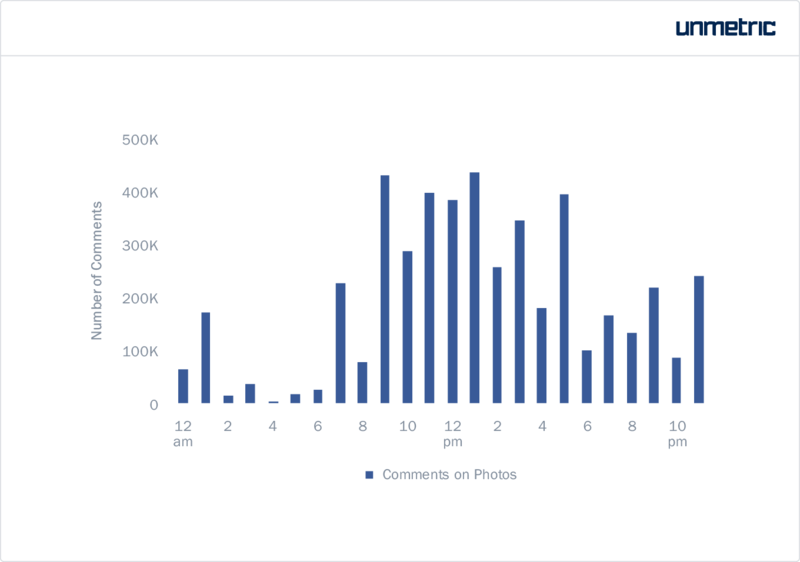 This chart shows the number of comments received by photos alone on each hour of the day. Here too, you’ll see that the engagement is prone to fits and bursts. The highest number of comments were received on photos that were published between 6-7 PM. 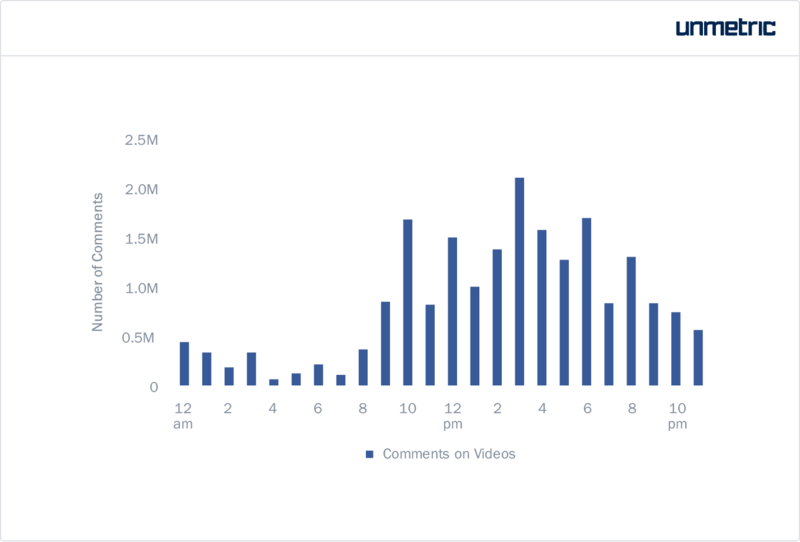 Videos received the most number of comments between 7-8 PM. What we’ve seen so far with personalities is that their timing does not show a clear trend. The number of interactions notched up every hour gets unduly influenced by a few standout posts. For example, when we were searching for actual posts that contributed to a surge in interactions at a particular hour, more often than not, it was from the POTUS. This gets further complicated when you take into account the fact that celebrities’ social media posts, especially the popular ones are picked up by news media and featured in their articles. This means that the interactions keep trickling in hours or even days after the post was originally published. Let’s conclude this discussion on personalities with a quick look at this heatmap of interactions. 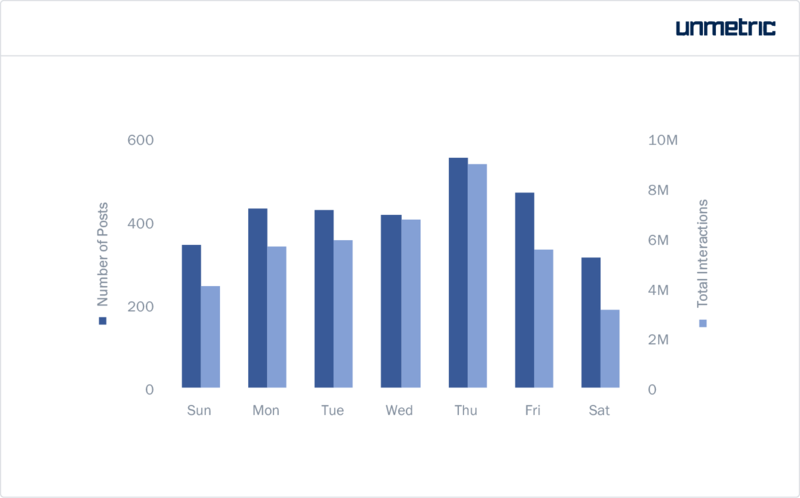 In the following chart, you’ll see that on weekdays, the number of posts published and the interactions they received do not vary too much. Weekends experience a slight lull. Here again, Thursdays witnessed the most number of posts being published and the most engagement. When you take a look at the number of posts published and the interactions they brought in, consider the magnitude of interactions they experienced. An average of 9.9 million interactions were recorded every hour! 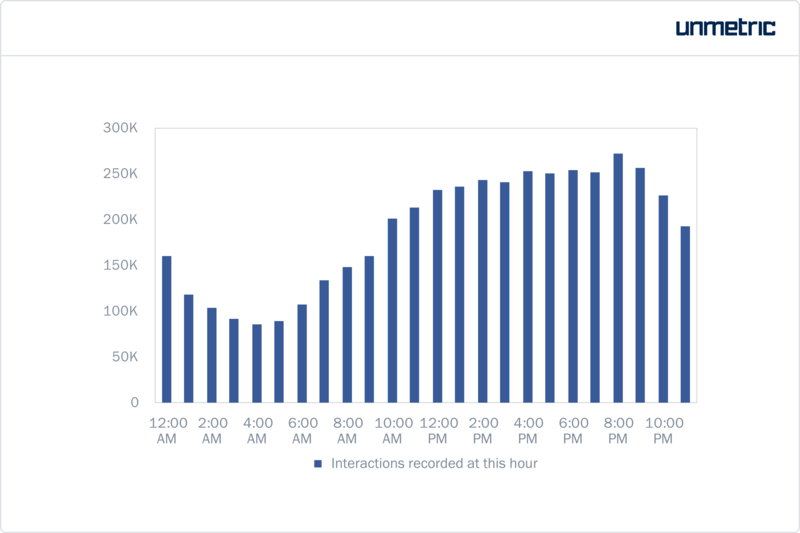 Between 9 AM and 9 PM, these brands experienced more than 10 million interactions every hour. Media and entertainment brands had the most success on their posts published between 9-10 AM, bringing in 19.3 million interactions. However, we cannot attribute these interactions to the success of just a handful of posts. The top 5 posts published this hour brought in only 1 million interactions combined. The volume of posts published might also be a defining factor. The best time to post photos for media and entertainment brands is between 1-2 PM. 9-10 AM also came quite close with a large tally of comments. With videos too, there’s no clear pattern in engagement. 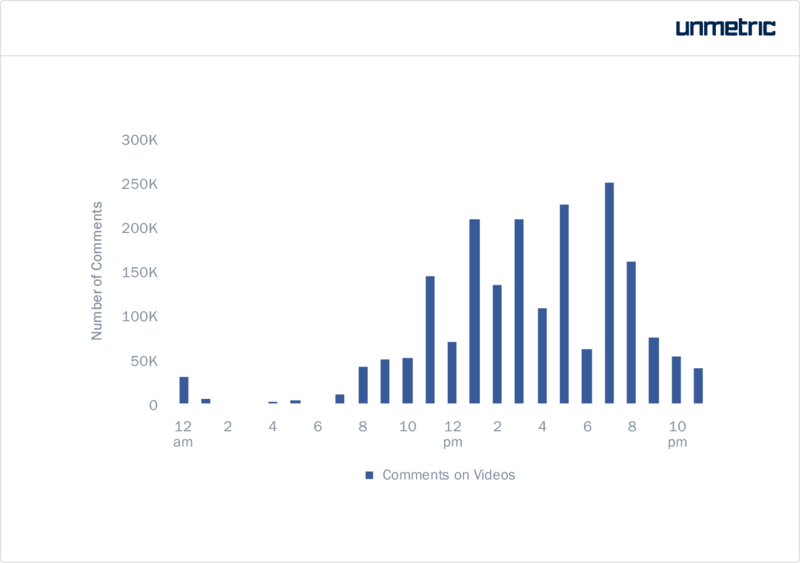 Based on just the number of comments received, the best time for media and entertainment brands to post videos is between 3-4 PM. Note that the post above involved paid promotion that boosted its visibility and consequently, engagement. Just like personalities, it’s very hard to single out a day of the week or a few hours that bring great engagement. In addition to engagement, one needs to take into account factors such as post volumes, virality, news value, promotion etc. 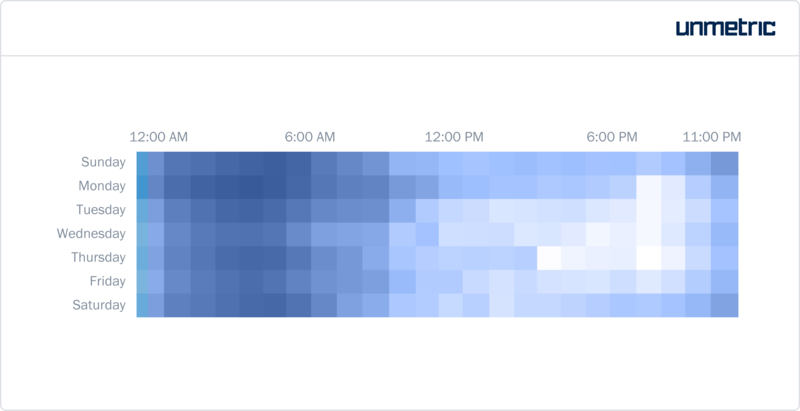 You can easily notice the lack of any apparent pattern in engagement and timing in the heatmap below. Thursdays led the tables again for the number of posts published, followed by Wednesdays. However, posts published on Sundays brought in more interactions. Sports teams notched up the most number of interactions between 4-5 PM. For this industry too, the trend in interactions tended to show sharp rises and falls. In the chart below you can see that the number of comments received by sports teams takes a huge leap after 3 PM. 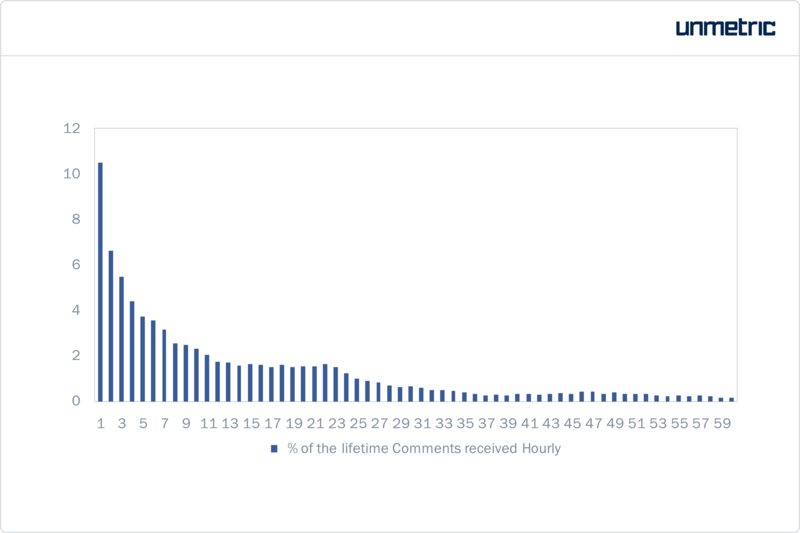 Except for a lull between 8-9 PM, the volume of comments remain high till midnight. Videos also saw a large amount of comments come in between 4-5 PM. Here again, there’s no distinct pattern that indicates when videos are more likely to get comments. The engagement patterns exhibited by sports teams seem to coincide with sporting events, as expected. 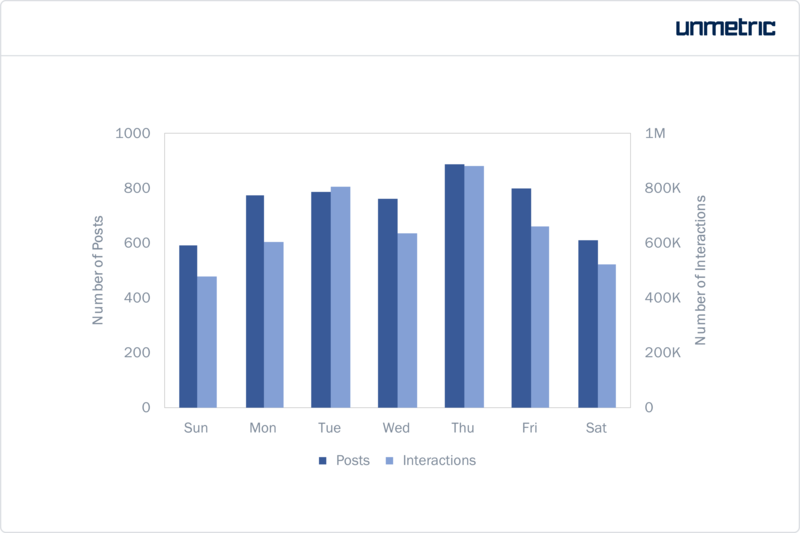 Because of that, you’ll see that post 5 PM and even on Sundays, they get good engagement. As you can see, several of these top posts coincide with various teams’ finale victory announcements. So, instead of saying that sports teams should post on Sundays between 3-4 PM, it would be better to conclude that sports team must post after major victories even if it’s a photo that’s hastily put together. In conclusion, what we’ve learnt from looking at sports, media and personalities separately is crucial for any brand that’s figuring out the best time to post on Facebook. Any mandate on the best time to post looks at only a few metrics and might include only a few brands in a specific region. In order to zero in on the best time for your social media activity, you will need to look at other factors that could explain why, for example, a post at 11 PM got such high engagement. Plus, before following these generic estimates, see if these findings hold true for your brand, industry and region. You can do all this and more using an AI-powered competitive intelligence tool like Unmetric Analyze. Get Introduced to Analyze Now!